After a long drive from Northern California. We made it into Red Rock Canyon State Park in the late afternoon and luckily we were able to get one of the last remaining campsites. It turned out that the park was holding Easter Morning Sunrise services and we had happened into one of the busiest weekends of the year. I had selected RRCSP thinking that it would be difficult to make it to Joshua Tree National Park in the daylight and it looked like an interesting place. The park campground was full but the campsites are dispersed enough to provide privacy from each other. The site we were able to get was right on the loop road but we were able to position the truck to provide a buffer for the sitting area. The camp area quieted down and we slept well. Easter morning the camp area was filled with the activity of a sunrise hike to the cliffs above. We opted for a quite, quick breakfast so we could explore some of the 4WD areas in the park and then make our way to Joshua Tree National Park. I’m sure we will make our way back to this park and explore the area a little more. We designed a custom pullout kitchen for our 4runner. It was designed to store our stove, a cutting board, and ARB fridge. All can be fully extended, individually or as a group, from the truck. The 500 lb rated full extension slides that lock in and out were purchased from Dunn & Watson. When fully extended the stove cantilevers a full 6 feet in front of the lowered tailgate. The 3-foot long cutting board provides a fantastic work surface. The kitchen was completed and installed just prior to a recent 3-week long adventure through Nevada, Arizona, and Utah. It performed fantastically and while it was the prototype there are only a couple of changes that I would incorporate. It is very versatile and makes camp set-up and break-down very easy. Roadside lunches are also a snap. Our camp was so enjoyable at Homestake that the idea of getting an early start quickly turned into enjoying the morning view. We Hiked to the top of the ridge west of our camp where we were able to overlook the Saline Valley and Lippincott Road where we had come from the previous day. 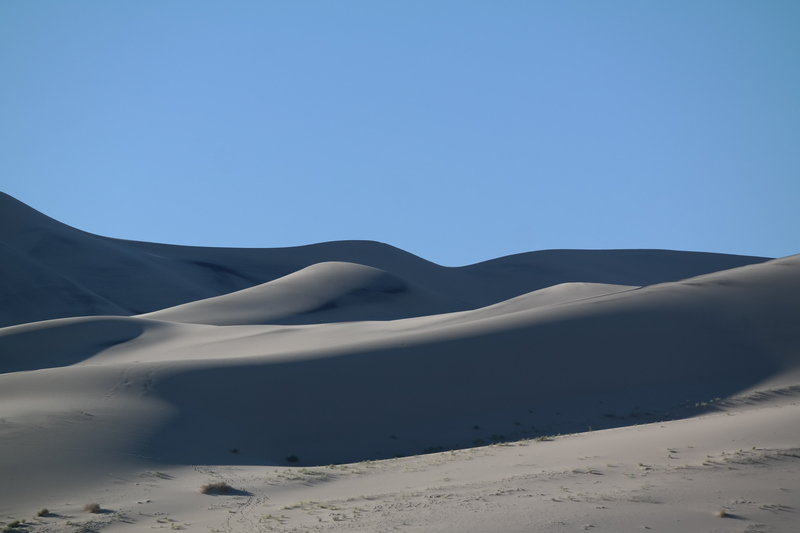 The trip from Eureka Dunes to Homestake Camp began with the sun rising over the Last Chance Range illuminating the dunes and revealing their sinuous shapes. The ground at the base of the dunes, the location of our previous nights camp, was still warm from the prior day’s heat. Our journey for the day would take us from Eureka Dunes up Steel Pass and through the narrow rocky ledge steps of Dedeckera Canyon and down the warm spring lined Saline Valley to Lippincott Road. Lippincott road is a steep and narrow shelf road that climbs to the Lippincott Mine area and connects to Racetrack Road in Racetrack Valley. Sixty plus off-road miles later we would arrive at our camp for the night at Homestake Camp. Our recent Death Valley Trip began after spending a few days in Yosemite Valley. Our first destination was Eureka Dunes in Death Valley National Park. Heading up Hwy 120 through the high country of Yosemite NP and over the Tioga pass. Then plummeting down to Hwy 395 we were on our way to Amigo’s Mexican Restaurant in Bishop, CA to pick up our dinner to go. We entrusted our 1993 4runner to Gary Kardum and his crew at Mudrak Custom Cruisers of Sonoma, CA. The rebuild included an entirely rebuilt engine, complete Old Man Emu suspension kit and a total front end rebuild, new OEM clutch, new brakes and upgraded rotors, reconditioned fuel injectors, all new hoses, and belts throughout and a new set of BF Goodrich All-Terrain T/A KO’s.